For Phra Viriyang Sirintharo, Lord Abbot of Wat Dhammamongkol, the journey towards enlightenment began more than sixty years ago in the north-eastern village of Nakhorn Rachasima when, as a boy of 13, he witnessed a miraculous event that would change his life forever. The day was much like any other, filled with hard work and household chores, beginning at dawn with the collecting of watermelons in the fields. After taking them to the market, the young boy would have to wait until they were all sold. As usual, he would not return home until after dark, but the day’s work was not yet over. All the water jars were empty. The nearest stream was about 500 metres from the house and it would take him many trips, returning each time with two fully laden buckets, before the jars were filled. Although very tired and ready for his bed, Viriyang was allowed only a short break for dinner before being sent out again, this time to fill the rice buckets which were also empty. In those days, mechanical rice mills were unheard of in the rural areas and each family had to husk the paddy for themselves. This was done by pounding the paddy in a large wooden mortar and pestle, a rather primitive device operated by vigorously stamping on a wooden lever. He remained unconscious for about an hour, but when he eventually came to, he was shocked to find himself unable to move a single muscle. He was totally paralysed. For about one month, Viriyang lay stricken while his parents tried in vain to find someone with the ability to restore his health. Secretly, the boy made a vow to devote the rest of his life to Buddhism should he be completely cured of his paralysis. Seven days later, a stranger appeared in the village; a white-robed ascetic who went directly to Viriyang’s house and told his father that he had come to cure his son. The man whispered in the boy’s ear, saying that he knew of his secret promise of eternal devotion and, after making him repeat the vow aloud, he proceeded to bring him back to health. The next morning, the ascetic returned and made Viriyang repeat the vow once more, then instructed the boy to meet him at the local temple later that afternoon. Arriving there at the appointed hour, Viriyang found the stranger waiting under a tamarind tree. After asking the boy to repeat his vow yet again, he led him to a wooded area beyond the temple where they found a buffalo. Quite unexpectedly, the ascetic took a knife from his bag and, with one swift stroke, severed the buffalo’s tail. Then, while reciting a prayer, he rejoined the tail as good as new, without seeming to hurt the beast in any way. The strange man went on to teach Viriyang a prayer and made him promise to recite it daily for the next 10 years. Naturally, the boy agreed to do as he was instructed and, with this, the mysterious stranger turned and walked away, never to be seen again. It was this dramatic encounter that set Phra Viriyang on the road to enlightenment. 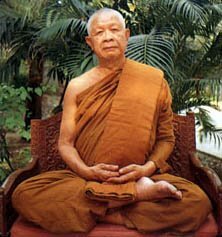 At 15 he was enrolled as a novice in the same local temple and became a monk at the age of 20.